Now entering our 10th year in business! 2016 is shaping up to be a very good year for Hannon Electric! With the help of all of our employees, we are looking forward to bringing savings to business all over Massachusetts. Check out the projects we have worked on from 2008 to 2015 in the navigation bar to the left. In 2015 alone, we helped our customers save an estimated 2,742,864 KWHs by installing cost efficient lighting upgrades! We are currently working on a new Benchmark Senior Living facility in Norwood with Callahan Construction who took the photo below. This 79,300 sqft construction job is well underway and will look great when it is finished! 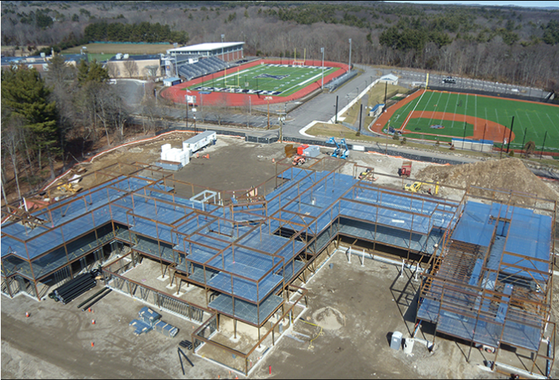 The picture below also features the Xaverian Brothers High School athletic addition that we worked on in 2014! Newman Associates in Canton, a supply house to HVAC and mechanical contractors, will be saving 85,000 KWH annually with the lighting retrofits being installed in their office space, warehouse and exterior. Our construction team has been awarded three clean room installations at IQE in Taunton and is projected to finish in March 2016. IQE designs and manufactures advanced semi-conductor wafer products. Hannon Energy Solutions has been working with Rand-Whitney at four of their locations to provide lighting retrofits in their exterior, office, and warehouse space. At over 600,000 sqft between the four locations, the company will save a total of 1,025,698 KWH and $188,592 annually. The photo below is a great depiction of the difference that installing LED lights makes on a space--there are fewer lights and yet the space is brighter than it was previously. Copyright © 2007- Present, Hannon Electric, Inc., All rights reserved.